While trying to think of topics for college essays, students often try to guess what the admissions officers are looking for, or what they want to read. It often feels like such a mystery. But in a recent news article, three top admissions officers shared exactly what they like to read, and how students can find topics they love. I hope this will help convince you about their effectiveness. Read the entire article, From the Pros: Best College Essays Hint at Who You Are, by Ellen Ishkanian of the Boston Globe. Or check out some of the following highlights. John Mahoney, director of undergraduate admissions at Boston College, has a few words of advice for high school seniors working on their essay: Keep it simple. Tell a story. “The essay lets us know, who is this person behind the numbers? Will they contribute?” Mahoney said. At selective schools, applicants are often very similar in academic achievements and extracurricular activities. In these cases, essays take on added importance, they said. “We parse it for clues about what this student will be able to contribute beyond their academic prowess,” Mahoney said. Jennifer Desjarlais, dean of admission and financial aid at Wellesley College agreed, saying sometimes essays affirm an application, and sometimes “the essay is a plot twist,” causing them to take a closer look at the applicant. Desjarlais noted that she always leaves the essay to the end, reading it only after she has looked over the entire application package. “I’ve learned about [the applicant] from lots of other pieces of information in the file, and this is my opportunity to hear about her from her, in her own words,” Desjarlais said. Don’t worry about trying to impress the admissions office through a grand experience or accomplishment. And you definitely don’t have to have suffered through adversity to be able to write a poignant essay, the admissions officers say. Desjarlais described a seemingly simple essay in which a student wrote about her daily 20-minute rides to school with her father, listening to National Public Radio. “It was a wonderful window into her relationship with her father, it was insightful, it told a real story of who this woman was,” she said. And perhaps most importantly, it didn’t try too hard. The reporter who interviewed these admissions counselors and wrote the article also culled 15 College Essay Tips from her own article. At the top: 1. Tell a story about yourself that will give the admissions office a sense of who you are. I especially appreciated Mahoney’s point that these essays can show admissions officers what students can contribute to their schools. To me, this should encourage students to try to find topics that will reveal things about themselves that officers would not find out about in other parts of the essay. And also to find a story that showcases a core quality. Wouldn’t you believe someone who revealed in their essay that they were generous, empathetic, passionate, focused, a leader, creative, etc., would have great things to “contribute” to a college? But how, exactly, do you “Tell a story”? Or find a “simple story?” Or look for a great topic or story if it doesn’t include a great accomplishment or suffering through great adversity? Start with my Jumpstart Guide, and read posts about Mundane Topics, Anecdotes and How to Tell a Story. 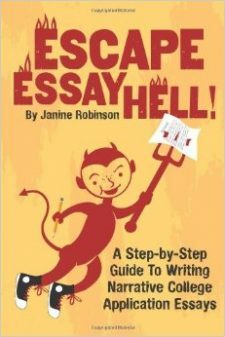 And of course, my book, Escape Essay Hell!, walks you step-by-step through the process of finding a topic, and telling a story using narrative writing techniques. I’m a professional academic writer and see tips for essay writing which you discuss here and its not an easy thing to write for others.